Removing A Bird On Your Roof - Whether you live in an urban area or in rural areas, almost everywhere you will find that there is a population of birds, and they will often be seen perching on the roof of a property. Indeed, there are many situations where several birds at a time will be perching on the roof, while there are birds that also tend to make their nest on the roof or around the roof line, while other birds also like to nest among the chimney stacks. There are several different ways that you can approach such a problem, and the right option can vary depending on your own situation and the type of bird problem that you have located on the roof. Why Do Birds Perch On The Roof? With the ability of flight, birds naturally find that the majority of the threats that they receive come from the air, so in most cases perching on the roof of a property will give them a good view of the surrounding area. Another of the reasons that birds do tend to perch on the roof is that in many cases, homes can be poorly insulated, which means that there is a level of warmth that is escaping through the roof of the property, which makes it a more pleasant area to stand for the birds. It is also worth noting that when the birds are perched on the roof, they will usually all be facing in the same direction, and the reason for this is that birds will generally face into the wind so that their feathers aren't ruffled by the breeze. While birds may find the roof of a domestic building to be a pleasant and relaxing place to spend some time, the reality for those within the building or those visiting regularly is that the birds can cause a lot of problems. One of the biggest issues is the amount of feces, and if you consider that just one pigeon can produce 25 pounds of feces in one year, it is no surprise that if you do have birds on the roof that you will often see the white stains on the roof and on cars around the property. This material can transmit diseases, while the birds themselves can also cause problems by scavenging through the garbage to find food, along with causing damage if they are creating nests on the roof. Will A Bird Repellent Get Rid Of The Bird? The appeal of using a bird repellent is the hope that it will be an easy and painless way of removing a bird on your roof, and these repellents can either come in the form of a chemical repellent which is said to drive the birds away, or in the form of an audio repellent. The problem with these solutions is that there is limited evidence to really show how effective repellents can be, and in many cases the birds will find that the reasons to stay on your roof are a stronger imperative than the discomfort caused by the repellents. In most cases, those who do choose to use bird repellents will usually find they will then have to spend more money in looking at alternative ways of getting rid of the birds. When it comes to delivering a permanent solution that will get rid of the bird on your roof, most people will find that making physical changes to the roof and around the roof line can help to solve the problem. Birds will usually look to perch on flat surfaces such as the tiles on the ridge of the roof or the gutters running around the edge of the roof, so installing roof spikes can be a successful measure that will prevent the birds from landing there. 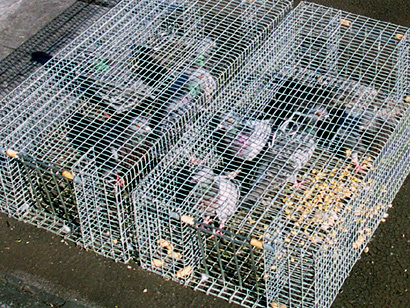 For larger areas where birds are causing problems, or on a flat roof, another option is installing an anti-bird netting, which is usually suspended several inches above the roof itself which will bounce the birds away if they try to land on the roof, which also provides a solution to the problem. If you are planning on trying to deal with the bird problem yourself, make sure that you take all of the necessary steps before climbing on the roof. Make sure that you dress appropriately, with thick long sleeved clothing to protect yourself from contact with the birds or bird droppings, and if you are likely to come into contact with a build up of the feces, it is worth wearing goggles and a breathing mask too. When it comes to climbing on the roof, make sure you have a friend or family member holding the ladder for you, and that once you are on the roof that you ensure your footing, and if you have any doubts at all about your safety, you should leave the work to a professional. Go back to the main Pigeon and Bird Removal page for more information about bird on the roof, and what types of noises or sounds they make. Do you hear the bird on the roof during the night or the day?